When an organization’s reputation depends on its GIS data, errors can introduce unacceptable risk. During the 2011 Esri International User Conference (Esri UC) in San Diego, Esri provided an opportunity for water/wastewater users to see how clean their data really was. Since then, the data health checks, as they are called, have become a staple feature at every Esri User Conference. Eleven water/wastewater customers signed up for health checks at the 2011 Esri UC, but they gone on to become so popular that they have been expanded. 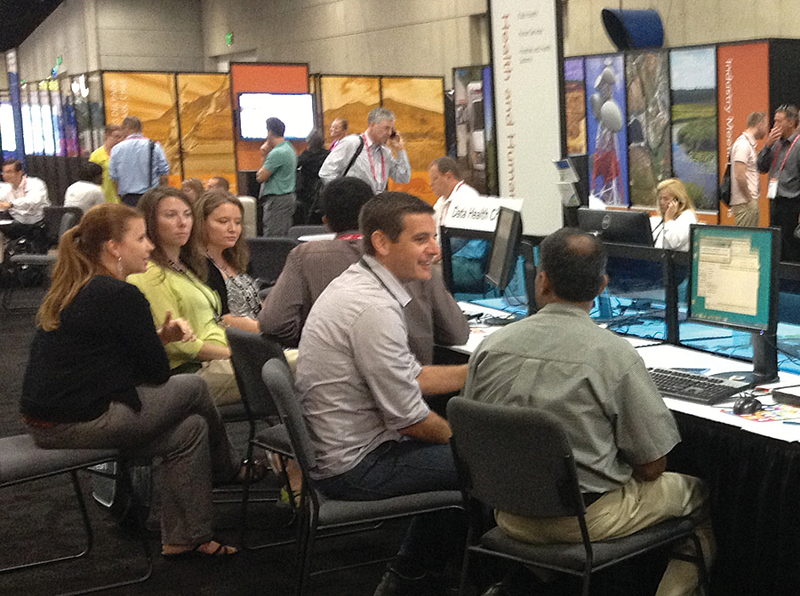 Five industries and more than 70 users used the service at the 2013 Esri UC. Health checks are now offered at other conferences, such as the Electric and Gas User Group and Pacific User conference. The data health check at the Esri International UC is free. For users, it’s as easy as bringing a sample of their data in a file or personal geodatabase. An Esri industry expert performs a diagnostic on the data using the ArcGIS Data Reviewer extension to assess its overall quality. Esri staff members explain the key data checks. Any errors detected are reviewed with the user. The error features (captured in a separate geodatabase) and a Microsoft Excel report with percent accuracy will be provided to take back to the user’s organization. At the 2011 Esri UC, the GIS team from the City of Woodland—a town in California with a population of 55,000 people—took advantage of Esri’s free data health checks for water and wastewater. Originally, most of Woodland’s GIS infrastructure data was ported over from CAD by a third-party contractor into a generic data model. The transition created issues, mainly in regard to topology, attribute population, and schema structure. For the last three years, the GIS team has been focused on customizing the schema fields and populating attribute values from historical hard-copy drawings. Now, the City of Woodland uses ArcGIS Data Reviewer to find and fix any errors in feature classes that need more attention. In addition to monetary savings, implementing ArcGIS Data Reviewer has resulted in better data quality and confidence that the data has been fully reviewed. “We can now perform consistent QA/QC tasks and keep our data in top shape after we have done the initial time investment,” Hewitt said. At the 2012 Esri UC, the City of Sioux Falls, South Dakota, took advantage of the free data health checks to assess its GIS data quality. City GIS professionals report that the health checks have led to increased data quality, integrity, and confidence in their data. They were introduced to ArcGIS Data Reviewer, which has allowed them to take a huge project, break it into manageable pieces, and prioritize the most urgent problems. City GIS professionals now perform regular data checks on the datasets that are maintained within the GIS department. They perform checks when there may be a problem with a feature class. For example, if a map service is throwing data-related errors in ArcGIS for Server, they will follow up with the standard ArcGIS Data Reviewer checks, in addition to checking the geometry. Data health checks are free, focus expressly on features and attributes, and—since only a subset of checks is performed during the session—take about 45 minutes. During production, Data Reviewer can be used to configure many more to validate all the organization’s business rules. Users may choose to implement the rules by themselves, work with Esri Partners, or use Esri Database Services to review and optimize data models, configure Data Reviewer beyond the checks that were run on their data at the conference, and implement workflows for data correction and maintenance. Watch for announcements regarding data health checks at the 2014 Esri International User Conference, to be held July 14–18.